On September 17th 2011, sleeping giants stirred as the perception of social and and economic injustice in the US finally crossed a critical threshold. And the people spoke. During the first week or two of the Occupation of Zuccotti park I was following along closely, but not yet fully engaged or plugged in. The movement erupted at the beginning of the semester, just as a good friend and I were embarking on a study of digital activism and collective action in the 21st Century. #Occupy quickly became both a primary source and case study as we scrambled to track the tools and tactics that were rapidly deployed. Within days the movement launched multiple web platforms, was taking online donations, was broadcasting a 24-hour streaming video, and started publishing a broadsheet newspaper. Protesters were sharing and exchanging citizen-generated-multimedia-speech using services distributed across the internet, and organizing themselves and their expressions around shared tags. The mainstream media disgraced itself as one of the first (genuine) networked-grassroots movement redefined activism by breeding wikis and folksonomies, with Blue Stockings and Indymedia. The protester’s literal occupation of space quickly went metaphorical, as everything from yoga to religion were soon “occupied.” At one point I came across a call to #occupypsychiatry, although no one seemed to know exactly what that meant. By that point many activist groups had descended on the park, and were tabling, distributing pamphlets, and competing to get their messages out while the media’s spotlight was shining brightly in their vicinity. In the early days of the occupation, while the weather was still mild, Zuccotti was a cross between a party and a seminar. Epic discussions around substantive issues sprung from every flagstone, and the best of Zuccotti suggested what a university could and should be. The occupiers rediscovered public space, and honest-to-goodness publics were formed. It occurred to me that, far more important than any message that #occupy might broadcast were the internal dialogues and communications between and among activists. Especially in these early, fragile stages, teach-ins and skill shares helped forge the alliances and friendships that would propel the movement through the winter and beyond. One of the nights in the park I found myself in a conversation with someone from the sanitation working group, and was struck by the humility of someone focusing their energy on sustaining the community instead of clamoring to be heard by the rest of the world. Through some of the mad pride networks I am connected to, I started hearing stories about protester burnout and emotional crisis at the occupations. Given the exacerbating conditions – lack of sleep, poor nutrition, exposure to the elements, and don’t forget the police brutality – it is unsurprising there were many frayed edges amongst the protesters. Although the movement had scorned resolving conflicts by turning to the criminal justice system, it had not formed an analogous consensus about resolving emotional crises by turning to the psychiatric system. Around the country reports of forced hospitalization (and medication) emerged, and people kept reaching out for materials that offered alternative perspectives towards handling emotional trauma and navigating crises. Over the summer I had been been working towards setting up on-demand publishing solutions for some of The Icarus Project’s publications. I had spent months trying to track down original indesign files, fonts, and assets, in order to recreate these publications according to the specifications the ondemand publishers mandated. Another good friend of mine was also in the midst of working on an #Occupy pamphlet, The 99%’s Guide to the Current Clusterf#*k, and that night something clicked. I imagined working together with radical mental health activist to remix a zine (aka pamphlet) that would present alternative perspectives on activism and mental health. I got really excited about a concrete way to contribute to the occupation. I bounced the idea off of some friends and we were all really jazzed about the project. 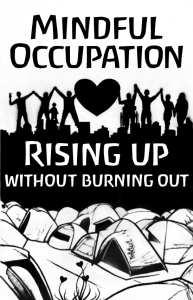 That night, Mindful Occupation: Rising up Without Burning Out was conceived. In May ’06 I visited New York’s annual Fleet Week and personally met a few drones who were sleeping below the flight deck of a U.S. warship. In the 5 years since, “unmanned aerial vehicles” have reproduced explosively, and are rapidly changing the parameters of war and American foreign policy. Glenn Greenwald describes the “Drone Mentality” that renders victims invisible and enables risk-free aggression and violence. Public anti-drone outcries are spreading, though media coverage of the effects of U.S. drone attacks is glaringly absent. My friend Madiha Tahir has been reporting and researching these attacks in Pakistan and the accounts she has gathered are quite horrifying. But the U.S military isn’t the only outfit with access to these technologies. Rupert Murdoch’s News Corp (!) is using a drone to capture footage (and who knows what else), and Polish protesters in Warsaw used a drone to capture footage of riot police attacking them. Last year some hobbyists buzzed the Statue of Liberty with an unmanned aerial vehicle, and didn’t even get fined. Drone technology is advancing very rapidly, though to the average observer the technology might not look that much different from 70’s-era remote control planes. Most of the advancements are happening in software, which is invisible to the casual observer, and also more difficult to prevent from proliferating. If you haven’t seen any of the amazing footage of quadcopters in action, take a peek. These machines are much simpler to pilot and steer than a helicopter, and are quite inexpensive. There are quad-rotor open-source hardware/software projects, like the aeroquad (complete kits $1.5k), and the high-end is quite affordable (< $10k) for news companies and local police departments. At the moment, the regulations around flying these drones is ambiguous. But the FAA is currently reviewing regulations, and a government agency predicts there will be over 15,000 civilian drones operating in U.S. airspace by 2018. Drones are already in use patrolling the US/Mexican border, and the Department of Homeland Security is helping local law enforcement agencies obtain them. When I saw the video of the Polish protesters (via @MutualArising), I began wondering why local news companies were still flying manned traffic and news copters, and then I ran across the story (via @jonathanstray) about Murdoch’s drones. From my limited research, I believe that non-commercial hobbyists are allowed to fly these vehicles below 400ft. I propose that Occupy Wall Street should fly drones at every protest, to counter Mayor Bloomberg’s egregious attempts to suppress journalistic coverage of the protests. It seems clear that a robotic arms-race is underway, and my friend Peter Asaro, a robo-ethicist who serves on the international committee for robot arms control (icrac), worries about an arms race where everyone from drug cartels to the paparazzi all begin abusing drones. I remember Eben Moglen predicting that it won’t be long before every self-respecting dictator has full regiment of killer robots. Unlike human police, robots aren’t likely to hesitate when ordered to fire upon civilians. 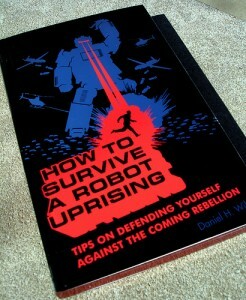 The right to bear robots? I am not convinced that drone-control is the best response to the asymmetrical power drones deliver (at least when it comes to surveillance drones, not armed drones). I think they best way to counterbalance this power is with open-source drones. The people’s drones. Update: As per @MutualArising‘s comment below, OccupyDrones has taken off!